Fill in the branches of your family tree as you to get to know the most important people in your life. 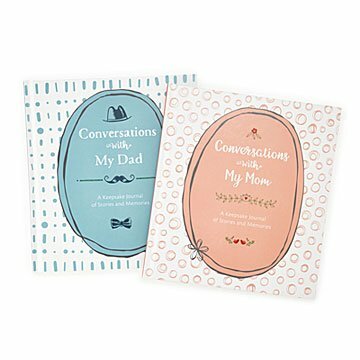 Described as "A keepsake journal for celebrating a lifetime of stories," these precious books will not only fill in the branches of your family tree with personality and life, but also help you to get to know the most important people in your life. Packed with over 112 pages of intriguing questions such as "When did you learn to drive?" "Who was your first crush?" "What did you think each of your children would grow up to be? ", this journal is sure to spark additional conversations, unlock colorful pasts and provide future generations with rich anecdotes of people, places and time periods. Features charming illustrations, spaces for photos and plenty of room to write, this keepsake journal could well become your family's most treasured heirloom. Because after all, the most important stories that we tell, are our own. Made in China. Available in Mother and Father editions. My grandmother has recently started showing signs of Alzheimer's. It has been very difficult for my parents and our entire family to watch her memories disappear. I wanted to find a way to capture my parents' memories before, God forbid, they start losing their memories too. These books are the perfect way to do that. It is a great way to guide conversations with my Dad. I love hearing about his childhood and the memorable things of watching us grow up. My dad loved this ida! Great gift idea, thoughtful and unique. A friend told me about these books and I am so excited to sit with my parents and discuss at Thanksgiving! My mother has begun answering the book which has become such a topic of conversation for us. It's truly a gift because it asks things I wouldn't think of and has really brought us closer. It's a gift for her that is actually a gift to me. After years of harassing my dad to write his stories down, he now has prompts to help him. He and I have plans to sit down and work through the book together because he has led an incredible life that needs to be documented. My parents have always been quiet, people of few words. They were confused about the book, or maybe concerned. However, both have started to complete and I feel as though it will fill in the blanks, and even more importantly be there when they aren't. I bought a set of these as part of my parents' anniversary gift. They loved the idea and we look forward to filling out the books together. A great way to learn things you might not otherwise ask about important people in your life. Very well priced.